Post-Tib Tendonitis is a strain place on the posterior tibial tendon. The posterior tibial tendon runs along the inside of the ankle and the foot. When there is post-tibial tendon disfunction, the tendon does not function to hold up the arch, resulting in flat feet. 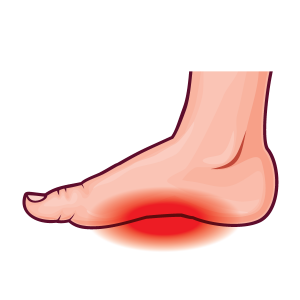 This can lead to heel pain, arch pain, plantar fasciitis and/or heel spurs. With post-tib tendonitis, pain will be more severe upon weight bearing, especially while walking or running. To treat pot-tib tendonitis, you can reduce your symptoms by limiting activity to control the pain and swelling. Stay off your feet a few days, then slowly increase your activity. Rest allows the tissues in your foot to heal. Conservative treatments (non-surgical treatments) include wearing a foot orthotic with rearfoot posting and longitudinal arch support, to reduce strain on the post tibial tendon reduce strain on the post tibial tendon prevent excessive stretching of the plantar fascia. The orthotic should also be designed with materials to comfort the foot and absorb shock. Wear the shoes that provide cushioning, support and shock absorption.